PHP Studio 2010 is an integrated development environment for PHP, providing comprehensive and easy-to-use solution for developing PHP based web applications. 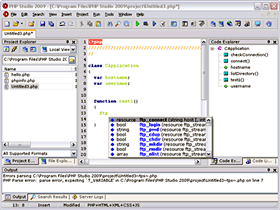 PHP Studio offers built-in HTTP server and internal web browser, convenient code editor supporting configurable syntax highlighting, code completion for PHP functions, code explorer, built-in FTP client, project management, file explorer, find in files, file comparison utility and more..
PHP Studio 2010 is an integrated development environment (IDE) for PHP. ...... them to a live server. * Code explorer: Locate class and function definitions rapidly through PHP code. * PHP function and parameter completion: You can quickly see PHP function list by pressing Ctrl+Enter and Shift+Ctrl+Enter for a hint pop-up containing parameter reference for selected function. Qweas is providing links to PHP Studio 2010 2.8.2 as a courtesy, and makes no representations regarding PHP Studio 2010 or any other applications or any information related thereto. Any questions, complaints or claims regarding this application PHP Studio 2010 2.8.2 must be directed to the appropriate software vendor. You may click the publisher link of PHP Studio 2010 on the top of this page to get more details about the vendor.